As the New York Times noted two years ago, in a popular article titled '"How goat is "the most widely consumed meat in the world." And last fall, in the paper's Sunday magazine, Michael Pollan recounted his adventures attending a 36-hour goat-themed dinner party, in which the meat of a single goat featured prominently in several meals. So is America finally falling in love with goat? Not necessarily; we may adore our beef, chicken, and pork, but lamb hardly registers as a meat on our tables, and goat even less so. That said, goat meat has begun turning up in the cold cases of major grocery chains, including Whole Foods. If your local supermarkets don't carry it, try small butcher shops, Latin and Asian groceries, meat vendors at farmers' markets, and CSAs that offer meat shares. Since we don't have a strong American tradition of cooking goat, here's a primer on common international preparations of an animal whose meat is prized for its versatility. #(clear n1).Italy. In the mountainous Abruzzo region, says Italian cooking expert and author Domenica Marchetti, baby goats are enjoyed in the spring months, while older animals are eaten in late summer and fall. Other regional preparations, she adds, include goat cooked alla brace (over hot coals), al forno (roasted in the oven), and sugo di capra, in which leg or shoulder meat is stewed with tomatoes, herbs, garlic, and wine, and served as a sauce over pasta. #(clear n2). [%image reference-image float='clear right' width=350 caption="A goat on a farm in central Oregon."]Greece. The Greeks enjoy katsiki yiouvetsi, or braised goat. In California, the Palo Alto restaurant Evvia serves this traditional dish with herbed feta, tomatoes, green beans, Greek olives, and orzo. As one of the restaurant’s signature dishes, it moves quickly. Around Easter, chef Mario Ortega marinates whole young goats in olive oil, lemon juice, Greek oregano, and salt, and cooks them on a rotisserie over oak wood. This dish is served with horta, or braised wild greens. #(clear n3).Iraq. The Iraqis make use of the entire animal when it comes to preparing and consuming goat. Butchers sell hearts, kidneys, livers, tripe, heads, shoulders, and legs, as well as whole goats. Diners enjoy chunks of seasoned goat meat kabob-style, as well as minced in the oblong patties called kofte or shaved in shawarma, thinly-sliced goat meat (or lamb) served with warm pita or lavash. 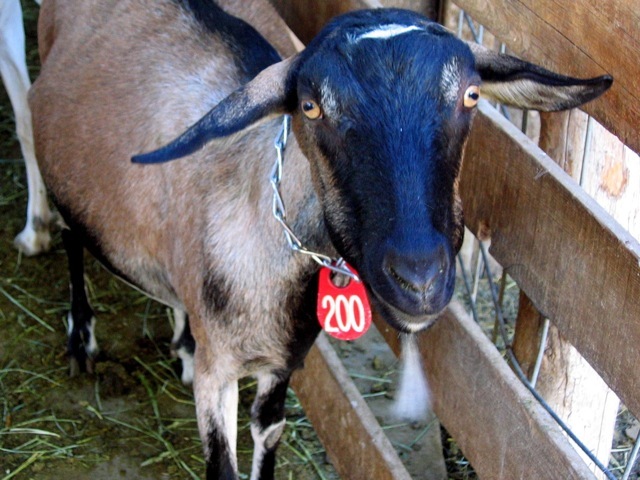 Goat dishes are especially prized at celebrations and on holidays, such as Eid and Ramadan. #(clear n4).Eritrea. The Eritreans enjoy goat in many forms, prepared both with and without the popular spice mixture berbere and served with injera, a traditional spongy, fermented pancake. Though I lived for two years in this small East African nation, I turned for goat advice to Jeffrey Shannon, a former Peace Corps volunteer who spent eight years in the country and whose goat reminiscences are fresher than my own. According to Shannon, goat (and also sheep) appears in dulet (minced tripe), zigny (a spicy stew), and onion-rich tibsi. But, he adds, you’ll also find goat in zilzil, "longer zigzag strips that are roasted on a clay brazier with hot coals inside, and usually mixed with onions and peppers." Capreto, or simmered kid, is also a popular Eritrean delicacy, says Eritrean Awet Haile. It’s a dish that recalls Eritrea’s history as a former Italian colony. #(clear n6).Mexico. Ruth Alegria, who teaches cooking classes and leads culinary tours in Mexico City, says that goat meat is a hallmark of the cuisine of Monterrey, in northern Mexico. “The preparation of cabrito a las brasas is a specialty not of the home cook but of restaurants, where the smell of mesquite wood mingles with the aroma of slowly roasting meat,” she says. Alegria adds that birria (a spicy stew served at celebrations), mole de caderas (another stew popular in southern Puebla), huaxmole de chivo (braised goat with chiles and beans), and chito (dried salted goat meat, jerky-style) are commonly enjoyed as well. #(clear n7).Nepal. One special-occasion goat dish popular in Nepal is khasi ko masu, says Pat Tanumihardja, author of The Asian Grandmothers Cookbook. To make this Nepalese curry, goat meat is marinated on the bone with garlic, ginger, yogurt, and garam masala for several hours, then sautéed in ghee and flavored with turmeric. It may be transferred to a pressure cooker to ensure tenderness, and is traditionally served with roti or basmati rice. #(clear n8).Jamaica. Chef Robert Simpson, a Jamaican native and executive chef at Coconuts and Back A Yard in the Bay Area, says the Caribbean island’s hilly terrain means goats roam freely. At Back A Yard, Simpson's goat curry frequently sells out. Made with a West Indian curry-powder blend, it's simmered on the stovetop for four hours, then served on the bone with rice, peas, and plantains. Goat, Simpson says, has its own distinct flavor — a bit gamy, with subtle undertones, but less pungent than lamb or venison. Jamaicans also enjoy a goat soup called manish water, made with goat head, feet, and cleaned tripe. Those interested in learning more about all things goat may want to keep their eyes peeled for a new book, Goat: Milk, Meat, Cheese, by Mark Scarbrough and Bruce Weinstein, to be published in April. p(bio). Cheryl Sternman Rule is a California-based food writer and the voice behind the blog 5 Second Rule.